2. The LED indicates the DC/Stepper motor power supply is working. The servo ports are 5V powered and do not use the DC motor supply. 3. 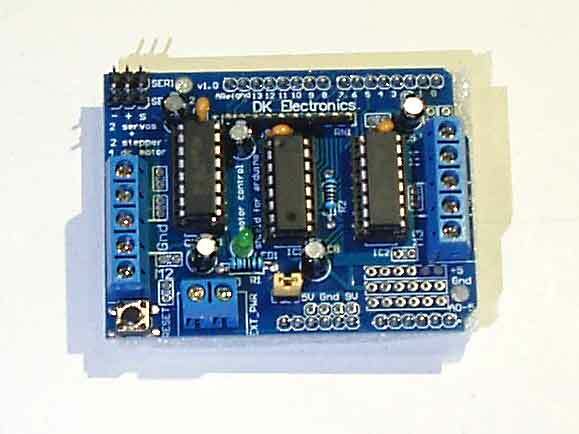 The motor controllers are designed to run from 4.5V to 25V. MOST 1.5-3V MOTORS WILL NOT WORK. 4. The motor driver chips that come with the shield are designed to provide up to 600 mA per motor, with 1.2A peak current. Note that once you near 1A load you' MUST install a heatsink on the motor driver IC, otherwise you will have thermal failure, possibly ruining the chip. 5. SN754410: You can use the SN754410 motor driver chip as well because it is pin-compatible, has output diodes and can provide 1A per motor, 2A peak. There are caveats when using this IC. It seems the output diodes were designed for ESD protection only and that using them as kickback-protection is a hack and not guaranteed for performance. For that reason the original Adafruit kit did not ship with the SN754410 and instead uses the L293D with integrated kickback-protection diodes. If you're willing to risk it, it can be viewed as a way to get more current. 6. If you need more power you can piggyback up to (2) more L293D driver chips soldering them on top of the L293D. You double the current capability! 7. You can't run motors off of a 9V battery. Use a larger Lead Acid or NiMH battery pack. 8. You should use two power supplies (split supplies.) One should be for the Arduino and one for the electric motors. Most motor problems are due to noise on the power line caused by using the same supply. Obviously choose a power supply adequate for the expected current load. 9. For heavier (real world use) you should use a separate power supply for your servo motors. You can cut the trace on the shield PCB going to the positive(+) side of the servo connectors and then connect an external 5-6V supply! 10. There are two places you can get your motor 'high voltage supply' from. One is the DC jack on the Arduino board and the other is the 2-terminal block on the shield that is labeled EXT_PWR. Warning! The EXT_PWR terminals on the shield do not have a protection diode. Be utterly careful when connecting external power or you will destroy the motor shield and/or your Arduino. See below schematic. 11. To use two separate DC power supplies for the Arduino and motors. Plug in the supply for the Arduino into the DC jack, then connect the motor supply to the PWR_EXT block. Make sure the jumper is removed from the motor shield. 12. Using RC Servos - Hobby servos are the easiest way to get going with motor control. They have a 3-pin 0.1" female header connection with +5V, ground and signal inputs. The motor shield simply brings out the 16bit PWM output lines to two 3-pin headers so that its easy to plug in and go. They can draw a lot of power. 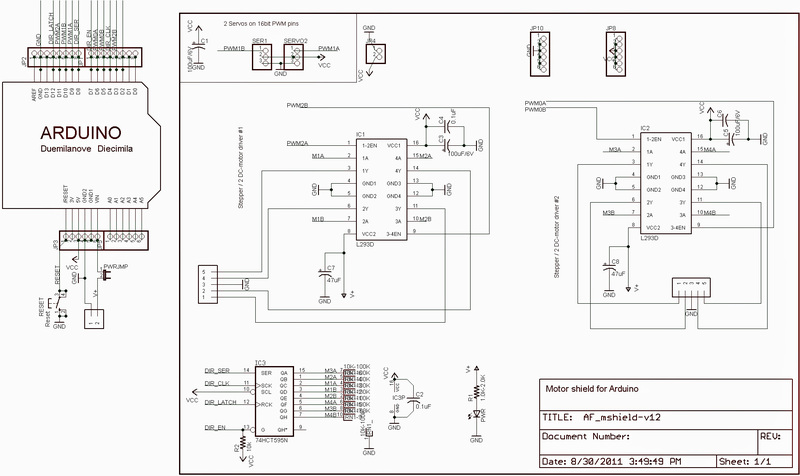 The advantage of using the onboard PWM is that its very precise and works in the background. You can use the built in Servo library. Using the servos is easy, read the official Arduino documentation for how to use them and see the example Servo sketches in the IDE. See http://www.arduino.cc/en/Reference/Servo for more details. Power for the Servos comes from the Arduino's on-board 5V regulator, powered directly from the USB or DC power jack on the Arduino. If you need an external supply, cut the trace right below the servo pins (on v1.2 boards) and connect a 5V or 6V DC supply directly. Using an external supply is risky as you can accidentally destroy the servos by connecting a power supply incorrectly! 13. When using the external supply header for servos, make sure that the bottom of the shield does not short out against the metal USB port housing on the Arduino. You need to insulate the bottom of the shield PCB under this area. 14. Using Stepper Motors - Stepper motors are great for (semi-)precise control, perfect for many robot and CNC projects. This motor shield supports up to 2 stepper motors. The library works identically for bi-polar and uni-polar motors. For unipolar motors: to connect the stepper, first figure out which pins connected to which coil, and which pins are the center taps. If its a 5-wire motor then there will be 1 that is the center tap for both coils. Jason Babcock has a great article on reverse-engineering the stepper pinouts. See http://www.jasonbabcock.com/computing/breadboard/unipolar/index.html There is also a great document on stepper motor types by Douglas Jones. See http://homepage.divms.uiowa.edu/~jones/step/types.html The center taps should both be connected together to the GND terminal on the motor shield output block. then coil 1 should connect to one motor port (say M1 or M3) and coil 2 should connect to the other motor port (M2 or M4). Running a stepper is a little more intricate than running a DC motor. 2. Create the stepper motor object with AF_Stepper(steps, stepper#) to setup the motor H-bridge and latches. Steps indicates how many steps per revolution the motor has. a 7.5 degree/step motor has 360/7.5 = 48 steps. Stepper# is which port it is connected to. If you're using M1 and M2, its port 1. If you're using M3 and M4 it's port 2. 3. Set the speed of the motor using setSpeed(rpm) where rpm is how many revolutions per minute you want the stepper to turn. 4. Then every time you want the motor to move, call the step(#steps, direction, steptype) procedure.#steps is how many steps you'd like it to take. direction is either FORWARD or BACKWARD and the step type is SINGLE, DOUBLE. INTERLEAVE or MICROSTEP. "Single" means single-coil activation, "double" means 2 coils are activated at once (for higher torque) and "interleave" means that it alternates between single and double to get twice the resolution (but of course its half the speed). "Microstepping" is a method where the coils are PWM'd to create smooth motion between steps. You can use whichever stepping method you want, changing it "on the fly" to as you may want minimum power, more torque, or more precision. 5. By default, the motor will 'hold' the position after its done stepping. If you want to release all the coils, so that it can spin freely, call release(). The stepping commands are 'blocking' and will return once the steps have finished. Because the stepping commands 'block' - you have to instruct the Stepper motors each time you want them to move. If you want to have more of a 'background task' stepper control, check out AccelStepper library https://github.com/adafruit/AccelStepper (install similarly to how you did with AFMotor) which has some examples for controlling two steppers simultaneously with varying acceleration. 15. 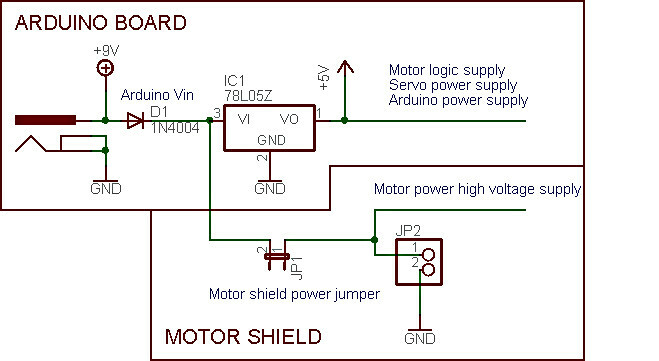 Using DC Motors - The motor shield can drive up to 4 DC motors bidirectionally. That means they can be driven forwards and backwards. The speed can also be varied at 0.5% increments using the high-quality built in PWM. This means the speed is very smooth and won't vary! Note that the H-bridge chip is not meant for driving loads over 0.6A or that peak over 1.2A so this is for small motors. Check the datasheet for information about the motor to verify its OK.
3. Then you can set the speed of the motor using setSpeed(speed) where the speed ranges from 0 (stopped) to 255 (full speed). You can set the speed whenever you want. 4. To run the motor, call run(direction) where direction is FORWARD, BACKWARD or RELEASE. Of course, the Arduino doesn't actually know if the motor is 'forward' or 'backward', so if you want to change which way it thinks is forward, simply swap the two wires from the motor to the shield. cmd - the desired run mode for the motor. RELEASE - Stop the motor. This removes power from the motor and is equivalent to setSpeed(0). The motor shield does not implement dynamic breaking, so the motor may take some time to spin down. To use this shield you must first install the Arduino libraries into your IDE! Move the AFMotor directory into your arduinosketchfolder/libraries directory. See the Adafruit Tutorial https://learn.adafruit.com/adafruit-motor-shield/overview to get started. It is a very decent introduction and helps a beginner to quickly useful designs. Hopefully AdaFruit will always keep the articles and documentation around but if not I will. The Github repo is https://github.com/adafruit/Adafruit-Motor-Shield-for-Arduino but I will also archive it here See http://terminus.attitude.net/local--files/arduino-motor-shields/Adafruit-Motor-Shield-for-Arduino-master.zip for the contents of the Github repo as of 2018-08-04. The Github repo is https://github.com/adafruit/Adafruit-Motor-Shield-library but I will also archive it here http://terminus.attitude.net/local--files/arduino-motor-shields/Adafruit-Motor-Shield-library-master.zip as of 2018-08-04. Clone or download the github repo zip file. Rename the directory to AFmotor (check that the renamed directory contains the .cpp and .h files) and install into the Arduinosketches/libraries directory. 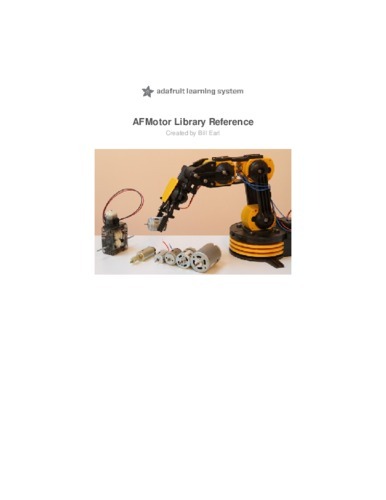 AccelStepper library with AFMotor support. The Github repo is https://github.com/adafruit/AccelStepper but I will also archive it here. See AccelStepper-master.zip as of 2018-08-04. This library allows for advanced stepper control including accelleration and decelleration, and concurrent stepper control! You still need AFmotor above! Rename the directory to AccelStepper (check that the renamed directory contains the .cpp and .h files) and install into the Arduinosketches/libraries directory.